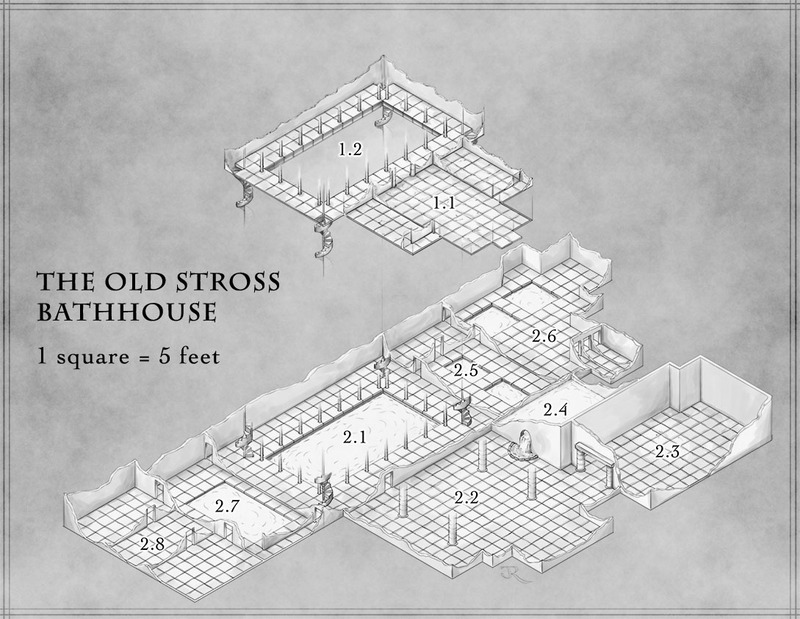 The Old Stross Bathhouse is a location from the Pathfinder adventure anthology Streets of Zobeck by Ben McFarland for Open Design. The challenge with this one was to get a lot of information on a very large location into a small space. The isometric style helps to give a sense of the design and structure of the place that I find harder to convey from a straightforward plan. I love the old Roman bathhouses in Bath so it was great to have Ben present a location based on those old structures. The location of an encounter determines the tone and flavour. It’s more fun to deal with thieves and scoundrels in a bathhouse or a rooftop garden than lurking in a dank underground lair. If you like playing adventures in the lethal urban jungle then I recommend you check out Streets of Zobeck.